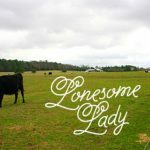 Rolling hills and groves of pine trees splash past my windshield as I cruise down an East Texas road, a spiral bound notebook and hand-me-down Cannon camera riding shotgun as always. My sights are set on the next farm I get to visit: Dodson Plantation. I drive through several small Texas towns; passing old storefronts whose faded signs and weathered bricks whisper stories of recession battling American grit, still standing tall and proud after all these years of fighting the fine fight of community versus commercialism. 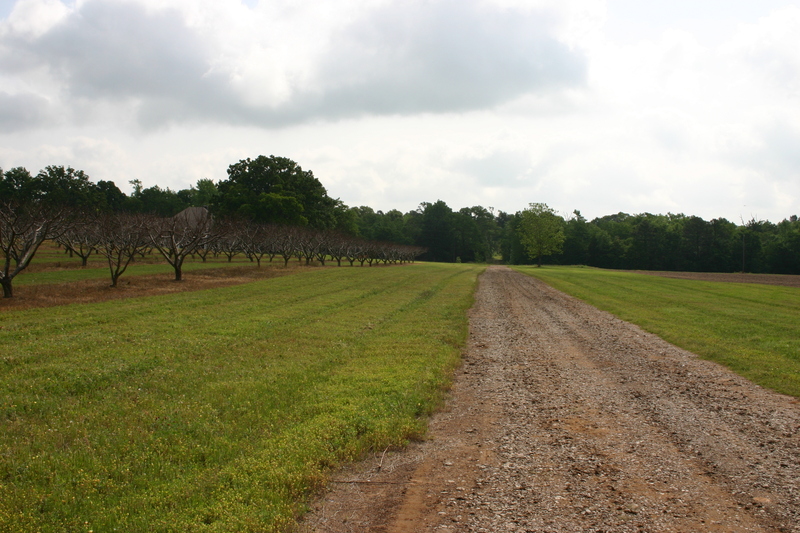 I coast down roads that sometimes get so narrow I have to pull over to the side to let trucks towing bales of hay pass me by, and, down one such road, so far down that I fear I may be lost, I crest a gentle hill to see a peach orchard sprawling out into the horizon. This is it: Dodson Plantation at last. Turning down a gravel driveway, a classically colored doberman bounds out to greet me. There is only excitement and curiosity in his eyes, so as I shift into park and step out of the car, I feel no fear. A thin man in a plaid shirt, jeans, and work boots steps out from the shade of a tree to greet me. He strikes me as too young to be the owner of such a large orchard, but as I get closer I see a few strands of grey in his beard that hint at wisdom. Tanned from hours working in the sun, and wearing a cap that proudly proclaims the family name, he stretches out a hand in greeting. “I’m Adam Dodson,” He says, and we shake. I hop into the passenger seat, wrapping the camera strap around my arm several times to make sure I don’t accidentally drop the Cannon in the fields, and we take off at a quick clip. Skinny, the dog, easily keeps pace with us as we bump along the grass into the orchard. “He goes everywhere I go,” Farmer Dodson says with a grin, and I snap a quick picture of the happy farm dog. 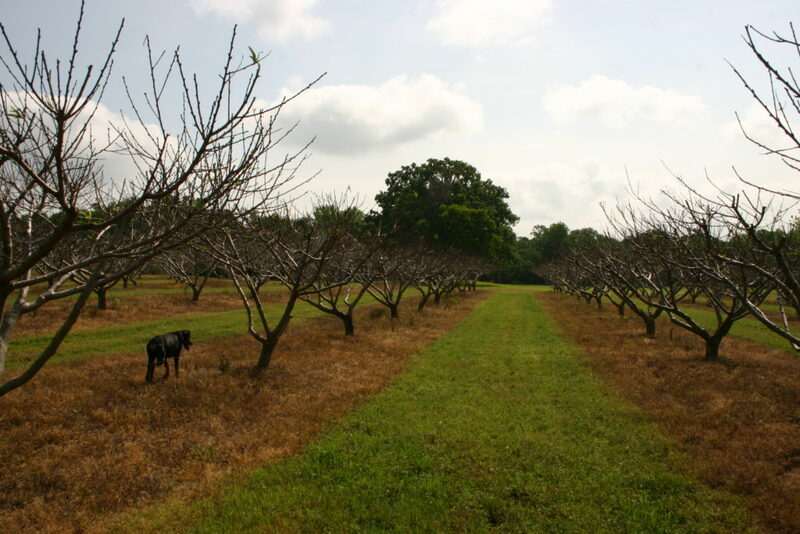 While the orchard itself is impressive, with rows and rows of peach trees meandering along the gentle roll of a slight hill, the trees are only just beginning to sprout the adorable pink blossoms. I grieve for a moment over the idea of getting to photograph a peach orchard in full bloom, but when I snap a picture of the sturdy limbs and neat rows, I see that there is still beauty here. The sky stretches above us in a brilliant blue, the land stretches beneath us in a healthy green, and the peach trees stretch up to the sunlight, urging their little buds forward like an impatient mother. Yes, even without clouds of pink peach blooms, this is a beautiful farm. I suppose that’s just how it is with farming, you can’t expect a perfect season every year. A feeling of pride comes over me as I think about the farmers here in East Texas who keep working with the land, no matter what obstacles they face. I can’t help but want to support them as much as I can. 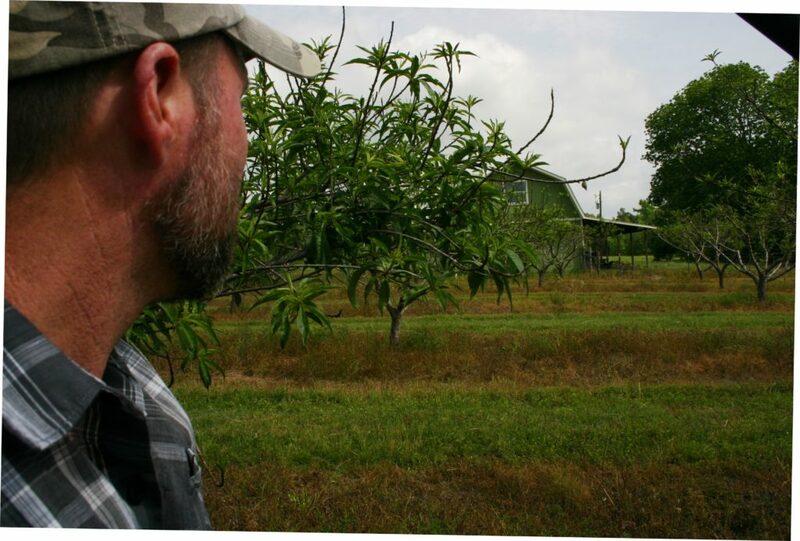 We drive deeper into the orchard, a soft breeze winding through the peach trees and into my hair, and he points out at least five different varieties of peach trees. I can’t tell them apart at all, they all just look like trees to me, but Mr. Dodson knows each one on sight. “So what got you started farming?” I ask, steadying my camera as best I can to snap another picture of Skinny. We pull into a small clearing and step out of the little cart. Scattered haphazardly in the tall grass are various farming equipment. 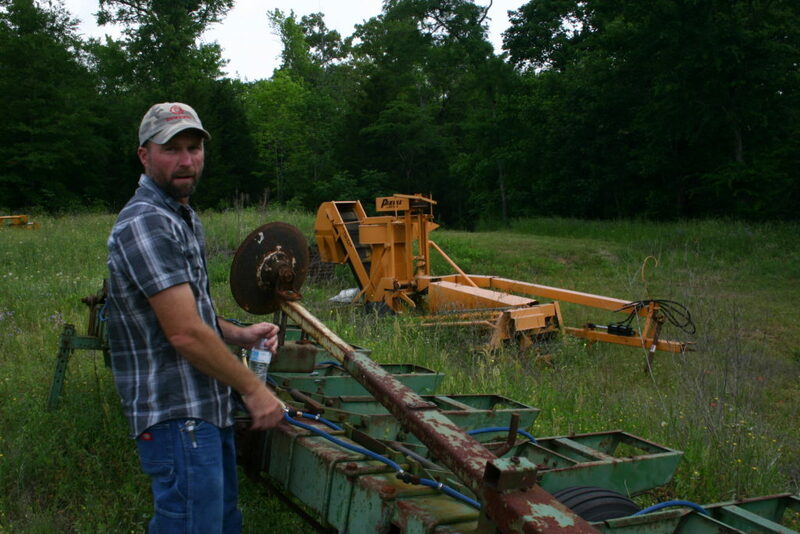 Some are rusted, some look new, and some I can only guess at their purpose, but Farmer Dodson knows each by name and use. 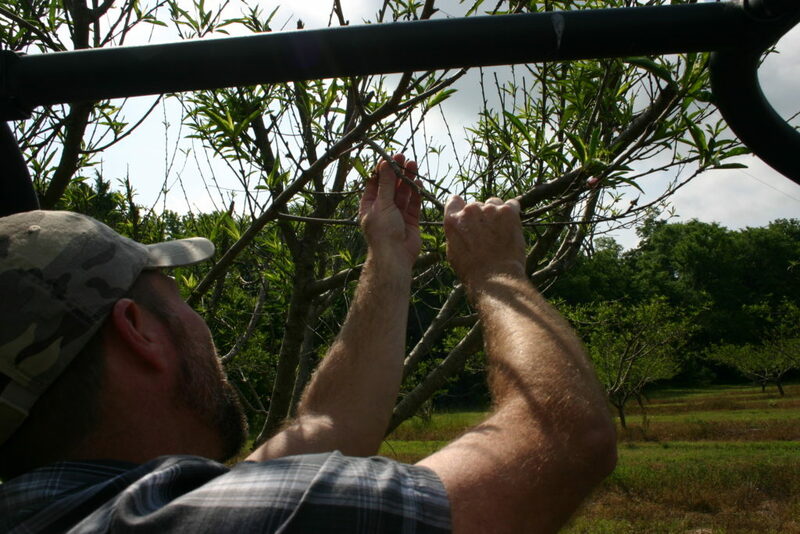 He carefully explains the reason he needs each one, and summarizes what a struggle growing a peach orchard was before he got them. “Definitely worth it,” I muse (as if I know anything about tending an orchard). There are official names for each contraption, but I all I catch is what they do; plant seeds, cut limbs, till the earth, mark rows. I can’t help but think about how much each machine must have cost! “How do you afford all of this! ?” I blurt out. I can see that his children are the main focus of his life. He points out a patch of tilled earth and tells me that he’s planning on growing pumpkins there in the fall. “Oh, to have at the market?” I ask hopefully. My heart warms at the image of two happy children, playing in a pumpkin patch. it calls to mind my own childhood; spending autumn afternoons out in the chilly fall air, wearing no jacket but warming up from running around, tangled hair flying behind me, chasing after my sisters. I can only imagine the fun I would have had if i’d had a pumpkin patch in my backyard! The imagined sound of children’s laughter fades from my ears as my attention is brought back to the present by a bright colored something in the grass. I bend down to examine it and discover the remains of a plastic egg. Farmer Dodson chuckles when I raise it up questioningly and explains that the Dodson Plantation hosted an Easter egg hunt over the weekend. 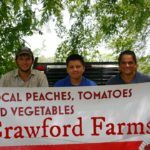 it seems that Mr. Dodson uses his beautiful farm to support, not just his family, but also the community. Looking at the land I can see why many people come out to the farm for family photos and gatherings. The farm is somehow simultaneously breathtaking and cozy. The perfect place to spend time together. 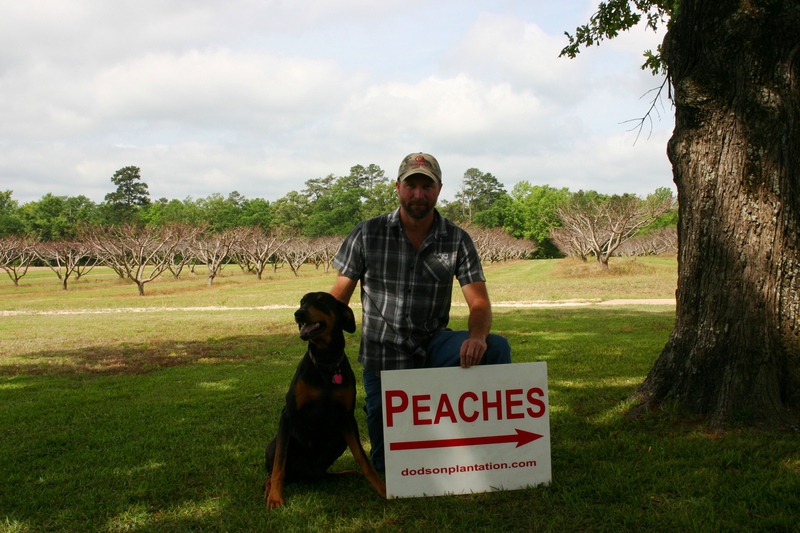 I smile at the hopeful peach trees, finding them beautiful even in this blossom-less state, and give Skinny one last pat as I tell Mr. Dodson that it’s time for me to go. He and Skinny walk me to my car and say goodbye. I drive down the gravel driveway, past the sprawling orchard, and over a gentle hill, knowing that I will always remember this place. I won’t remember it with soft billowing clouds of pink blossoms. I won’t remember it with ripe juicy fruit. 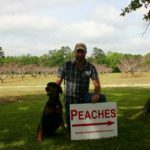 I will remember it with healthy trunks and proud strong limbs reaching up into the blue East Texas sky, whispering of hopefulness and the promise of peaches in June. Thank you for the perfect picture painted with your extremely good writing style. I’m more conscious now of the hard work that’s involved in an everyday basis. I feel like I have to go and experience it for myself. I always wondered why they didn’t bloom some years as they should. Now I see, not enough chill days. 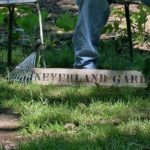 900 trees! Wow! Loved it!